Eid Hairstyles for Girls. Eid is one occasion where girls love to dress up well. While dressing up, hairstyles are also given top priority. Girls make sure that they look good and styling from top to bottom. A good hairstyle with a beautiful outfit is like a cherry on the top. Since Eid is just around the corner we thought of showing you all the most trending hairstyles for Eid. Hairstyles play a major role with the appearance. Any girl who dresses up well and doesn’t concentrate on the hair will lose the attention. Don’t ever leave without a stylish or a simple hairstyle. It will automatically add more charm to your appearance and in no way, you will look dull. A complete eid look depends on many things like your jewelry, dress, mehndi, footwear.So here is the complete package for 2017.How to look gorgeous on Eid. heck out these post to make a perfect combo of all these. 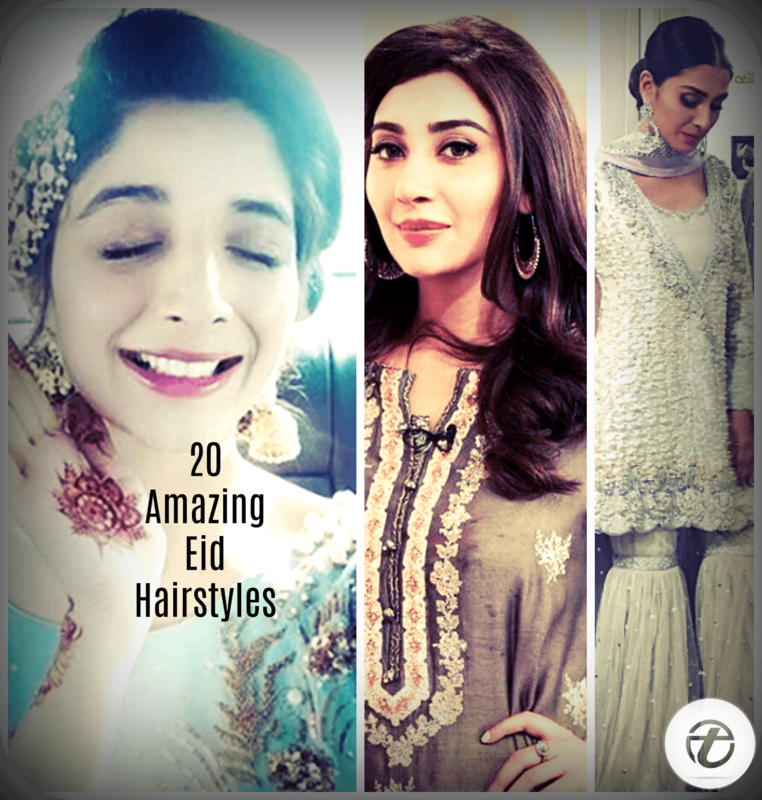 And at the end, we have a special collection of beautiful celebrities and their Eid hairstyles and these are some hairstyles that you wouldn’t want to miss, so read on! For Eid, you can always try several kinds of hairstyles to look good. Try experimenting with curls, buns, braids etc. Eid hairstyles appropriate with eastern dresses should be exclusive. Keep following the latest 2015’s eid hairstyles trends. Then you can further choose the style you would like to go with. You always need to experiment with several looks to find the best one. Braids can never go out of fashion and you can always try the simplest of hairstyles and then jump on to the difficult ones. To update the look one must follow the trends. Or you can get a new cut, colour or both. Get them cut by a professional so that it looks well presentable on you. With Eastern clothes on Eid, hairstyles such as long curls or hair braids look amazing.Here are few pictures of Eid hairstyles that will help you pick up your favorite one. For girls with short hair, messy buns are one of the easiest options to go for. Do you have a beautiful neckline and collarbone? Then why not show it off using these hairstyles? The side fringe makes this hairstyle a great choice for those with a square shaped face. The front braid hairstyle looks great on girls with heart shaped or oval faces. However, if you have a square shaped face or a bigger forehead then it’s best to avoid this one. For those with long hair and good volume, this is an extremely creative hairstyle to go for. You can always make your hairstyle stand out by adding statement accessories like clips or simply using some flowers from your garden. Here’s the gorgeous Urwa Hocane in an all white and angelic look for Eid. She has beautiful long hair so she styled them with a messy blowdry for some beachy waves. Do have a look at these beautiful clips from Urwa Hocane Farhan Wedding Pics. Next up, we have the famous Pakistani beauty who recently made her awesome Bollywood debut. Her Eid 2016 look was pretty simple with a sleek bun. But we’re hoping to see a more fancier look this eid from her! Aiza Khan too went for a similar hairstyle for an Eid 2017 show but she chose a more prominent mid partition. We can’t take our eyes off that sparkly outfit and gharara pants though! Eid is always a good time to go for a new look. So if you’ve been planning to get your hair colored or get hair extensions then this is the perfect opportunity to take the leap. You can take inspiration from the cute and bubbly actress Hania Aamir who recently got a complete makeover by choosing long hair extensions. Her transformation was lovely and just in time for Eid. And last but not the least, we have the gorgeous Aisha Khan and Maya Ali, both in soft curly waves hairstyles for Eid last year. We can’t wait to see how these divas will doll themselves up for this Eid. All the hairstyles chosen are latest and stylish. Whether you are a young girl or a woman, you can try making these hairstyles. It will surely look good on you. It is every girl’s dream to have a stylish hairstyle for any event. They always stay confused. Talking about popular hairstyles such as the fringes, layers, etc. you can also try these cuts according to the face shape. Keeping all of the factors in mind we chose the best hairstyles for Eid. These are absolutely easy to make and with tutorials it can be done more easily. Nowadays hairdos are very important in fashion. Hairstyles matter as much as clothes do. They make your appearance good and presentable. The hairstyles shown above are the most and impressive hairstyles with waterfall, feather, twist, bun, and braids. These are perfect for Eid. Hope you all will love trying and experimenting with unique and creative styles to look charming on Eid. Make your Eid the best one by looking your best. It’s a really very good post related to hairstyle, All these hairstyles are amazing which guides everyone, it gives such a great information which is very helpful. thanks for sharing such great ideas.